Editor’s Note: FightingArts.com is pleased to offer the second in a series of articles on ground technique by Eric Joseph. Although somewhat diminutive in size, Joseph is one of the most daunting grapplers I have known, a person who combines tactical knowledge, superb technique and lightening fast speed. Thanks also go out to Mike Hawley, another fine judo-ka and superb aikido-ka, who assisted. Even if you are a great puncher, it is also important to know basic ground fighting techniques. Not only will this knowledge help make you a better ground fighter, but it will also help you avoid techniques executed on you. This cross armlock is one of the most versatile and often used techniques on the ground. 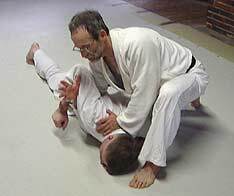 Called juji -gatame in judo, it is classified as a kensetsu waza (against the joint technique). It is also used in jujutsu and many no-hold-barred full contact competitions, such as the UFC. It can also be used on the street. But be careful. Your opponent might have friends nearby who just might pounce on you, or kick you while you are otherwise preoccupied. It is excellent, however, for one-on-one engagements. Interestingly, those trained in wrestling often automatically turn so that their back is up. Being belly up makes you vulnerable to being scored upon in wrestling, but in real-world fights it is exactly where you want to be. 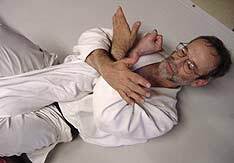 With your back up and an opponent lying on or across your body, you are vulnerable to fist strikes, elbows, chokes, leg techniques, or as here demonstrated, an armlock. In the photo sequence that follows, the cross armlock is executed by a person who is above and positioned across the opponent. The exact position is not important. Many other starting positions are possible. Photo1- Your opponent is face down. You are on top and attack from the side at a 90 degree angle. Photo 2- Dig your right fist and forearm down, between his ribs and his upper arm, and force it under and up, so your open hand is in the crook of his bent arm. Photo 3- Continue to slide your right arm deep into your opponent’s elbow joint and start to take out the slack. At the same time move your left foot across his head. Photo 4- Pull the opponent’s elbow up to your chest and hold it there. Photo 5- Start to lie on your back as you take out the slack of your partner’s arm. Your right foot is wedged under the opponent’s side while your left lower leg pulls in the opposite direction against the opponent’s head. Squeeze your knees together as tight as you can. This is the key! Photo 6- Lock partner's wrist to your chest and arch your stomach/abdomen upward. Here I have crossed my arms over the opponent’s forearm (holding his arm lower in yours gives you more leverage). Be sure his elbow is facing downward. Photo 7- Make sure your heel is deep in your partner's neck so he can't escape and that your right foot and lower leg presses inward so that the opponent’s body is angled upward. It is the upper pressure of your abdomen/stromach against the downward pull on the wrist that creates opposing forces that can apply pressure on the elbow of the opponent’s arm. You need not be on the ground to execute this armlock. 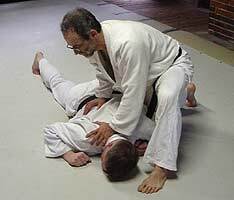 If you have thrown your opponent onto his back (if on his stomach, you would just sink down and proceed as shown above) this armlock can often be executed. The same technique is available to a karate-ka or boxer who had blocked a punch and either knocked, or tripped/swept the opponent to the ground --- if you have the opponent’s right arm in yours and are standing by his side. If you are still holding the opponent’s right arm while he is on his back on the ground, grasp the wrist with the other hand and pull up quickly and sharply. Almost simultaneously drop down. Your buttocks should land as close to the opponent’s side as possible, right knee bent with the foot wedged under his body (his right side lifted off the floor). At the same time the left leg should be placed over his neck or shoulder. This should all be done very quickly so your opponent does not have time to counter or try to escape. As you drop down be sure to keep pulling his right arm. Also bring your knees together strongly so you can hold his arm tightly between your thighs. As noted above, and you can now refer back to photos 5 – 7 , to apply pressure against his elbow hold his arm to your chest (with your hands or with your forearms crossed over his arm) straighten your body and arch your back (which raises your abdomen). If you are on the street and want to shock/strike your opponent, your left heel can strike across the face/head as the foot is moved forward over the opponent's head/shoulder. This can be a dangerous technique, however, so if practiced it should be done in slow motion. Escaping from this armlock requires that you execute counter measures before the armlock has applied pressure to your elbow. 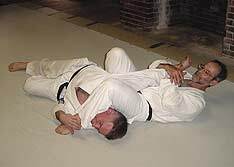 1-If the person trying to execute this armlock on you has not positioned himself up against you with his foot wedged tightly under your side, you may be able to turn toward him and roll over or toward your outstretched arm. As you do this, you can try to twist your hand and bend your elbow to the side (outward) as you try to pull back with force. Try to grab your own right wrist or sleeve to assist in the pull back. Try to draw your own elbow down toward your right ribs (and between yourself and your opponent). 2- If the armlock is almost in place, twist your body by lifting the leg (closest to the opponent) and moving it up and over the other as the body turns almost fully over. This places your body parallel to your opponent and between his legs. This eliminates leverage on your arm. With your little finger now facing upward, you can pull your hand free. 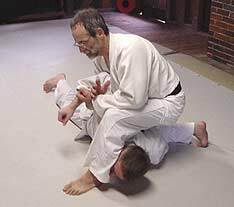 3- If the armlock is almost in place, use your left hand to grab your opponent’s ankle (of his leg placed over your head/neck/shoulder) and lift it upward so you can turn over (turning toward the leg that had just been leveraged upward). This places you in a position as in number 2. A final note of caution: The techniques shown and explained above can be very dangerous. Practice under supervision of a qualified instructor and be careful not to put too much pressure on your opponent’s elbow. 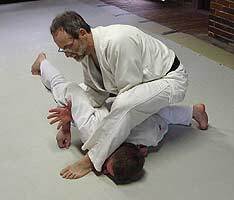 Eric Joseph has been a practitioner of judo since 1971. He is a 5th Degree Black Belt, USJI, US5F (Kodokan), Certified National Referee, Certified Kata Instructor, Certified Judo Coach, USA National Masters Champion and Pan American Games Kata Champion. In Buffalo, NY he is affiliated with the Kintora Martial Arts Center. He also teaches aikido at Bill Adam’s Martial Arts and Fitness Center in Elma, NY. Other experience includes Danzan ryu jujutsu.